Phyllo appetizer bites are easy to make and a tasty appetizer to have on hand for guests. You’ll love the flavor of this cheese and cherry combination. If you like these appetizers, you’ll love our Pesto Cheese Blossom, Spicy Artichoke Dip, and Copycat Bloomin Onion. Need a super easy appetizer for your next holiday gathering? If so, you’ll definitely want to give these bite-sized phyllo cups a try. You’ll want to bake these cute appetizers up in a mini muffin pan if you’re working with phyllo sheets instead of phyllo cups. The flavors of warm, melted Brie and sweet dark cherries are enhanced with a slight hint of maple syrup. For a more complex and savory flavor combination, add some fresh thyme leaves to each cup prior to baking. You’ll love this fun and fruity appetizer. Cherry is a delicious filling for these appetizers, but you could also mix things up and try jam, fig, and berry fillings. One of the best things about this appetizer recipe–besides the taste–is how easy it is to make. We’re talking about a recipe that is so easy to whip up that you’ll wonder why you haven’t made them before. It’s also one of those recipes that will get your creative juices flowing. As in–think of all the vast fillings that you can put in these flaky phyllo cups. Personally, we can think of about a dozen twists for this delicious appetizer recipe! 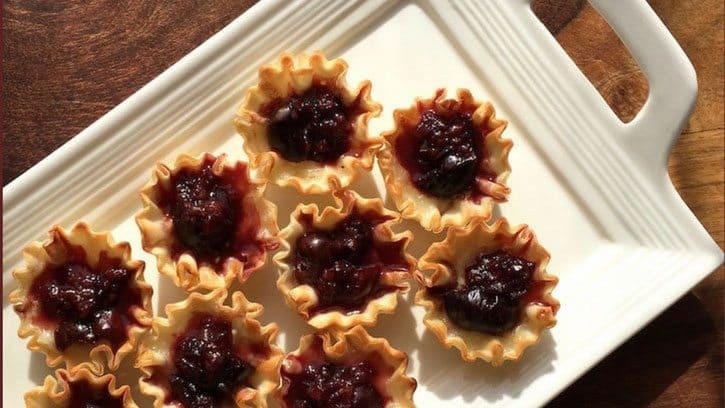 If you enjoy these Brie and Cherry Phyllo Cup appetizers, you’ll probably love making other kinds of appetizers with phyllo cups.